With a strikingly interesting appearance, it is no wonder that the Crested Caracara is Mexico’s national bird! These animals are quite resourceful, and when finding food will cleverly take full advantage of every opportunity afforded them! 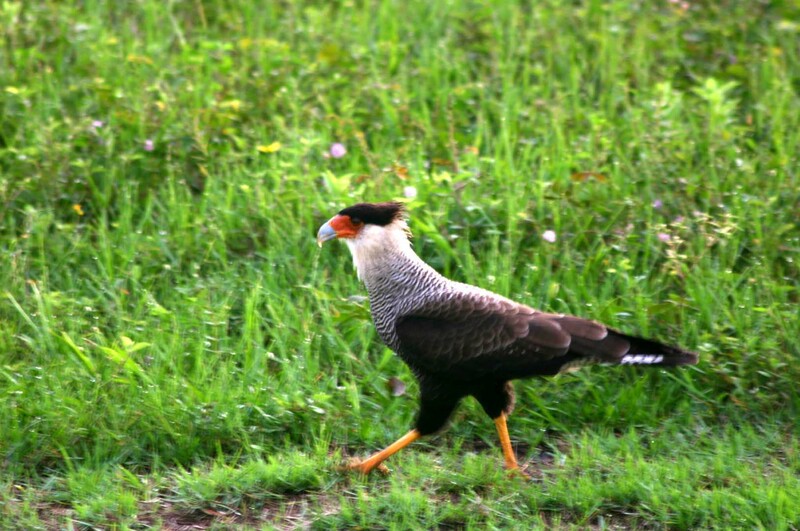 In the wild, Crested Caracaras inhabit open brush lands. They can hunt insects and small animals. They feed mostly on carrion. Sometimes, the Caracara will visit carrion only for the potential to uncover insects in the carcass! Crested Caracaras will also harass other birds, even those as big as buzzards, until they drop their food for the Caracara! Their long talons aid the Crested Caracara in scratching the ground to unearth insects. Their long legs allow them to wade in search of frogs. These birds will also eat sick young livestock, turtle eggs, fish and even small turtles! 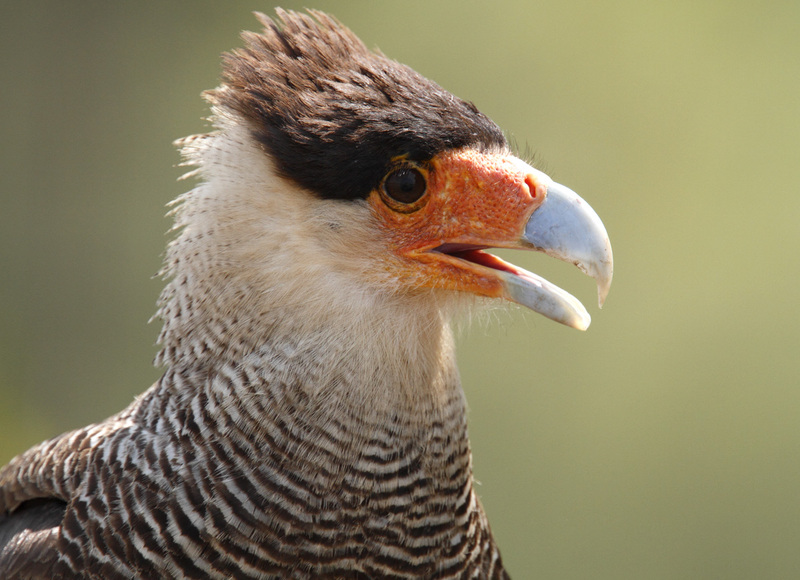 Crested Caracaras make different sounds for alarm (shrieking), protest (repeated clucking sounds), and mating (repeated clicks ended by a drawn out trilling noise). 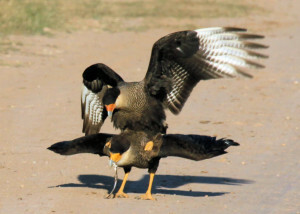 During mating season, male Crested Caracaras will fight each other for females in mid-flight! 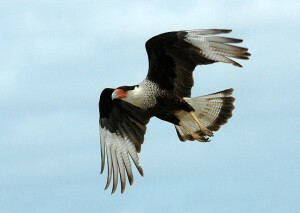 The Crested Caracara has a long neck and can be identified by its white wingtip patches, white head and white tails. The rest of the wings and the back are black, but are brown in juveniles. The tail also has a terminal band, which is black. The head is accented by a black crest, which is shaggy, and the feet are yellow. These features have been reputed to give the Crested Caracara an appearance somewhat like a Bald Eagle crossed with a common chicken wearing a funny wig! 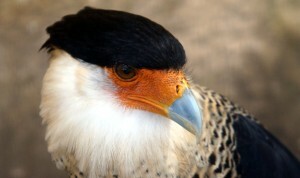 Although the cere of the Crested Caracara is red, it is reputed to turn yellow when the bird becomes startled. Their bills are hooked and quite strong. The Crested Caracara’s talons are rather blunt and somewhat thin. The Crested Caracara is featured on Mexican coinage and is Mexico’s national bird. They are found from the southern tip of the United States all the way down through South America, and are very graceful in the air despite a somewhat strange appearance on the ground. 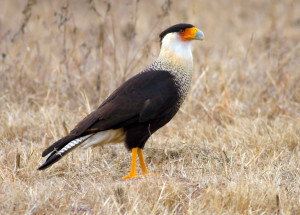 Because they have been known to take weak young livestock on occasion, Crested Caracaras are not favored by farmers. Although the Crested Caracara is scientifically classified as a Falcon, it is actually very far from other members of this family in terms of physical appearance as well as behavior and habits! Crested Caracaras build loose nests from sticks or other materials. They line the nests with dung or bits of animal matter. The nests are placed in dense clumps of vegetation, tree or cactus branches, marshy island ground, or overhanging rocks. The mating cry of the Crested Caracara involves the male throwing his head backward to attract a female in addition to territorial fighting. Once a male has chosen a female, he will act as a lookout at their nesting site but may abandon the area after sounding the alarm for danger! Usually, Crested Caracaras lay two or three eggs between November and February. Both parents will contribute to nest building, incubation and the raising of the young. In about four weeks, the eggs hatch and young Crested Caracaras remain in the nest of their parents until they are between eight and 12 weeks of age.